Ah, Spindex … just one tiny vowel away from spandex. If you haven’t heard of Spindex yet, it’s a Microsoft FUSE Labs service that was rolled out in beta and announced at the Web 2.0 Expo in San Francisco in May. Here is a quick video overview of how Spindex works via interview with FUSE Labs’ Matt MacLaurin, courtesy of Information Week (if you want to skip my review). Since it’s an invite-only preview at this point, I went to Spindex.me to see if I could get in. The problem? You need a Hotmail ID to gain access. And since I let my Hotmail account go 10 years ago (your grandma uses Hotmail), I had to set up a new one for an invite to Spindex; déjà vu set in as the Thong Song played in my head. 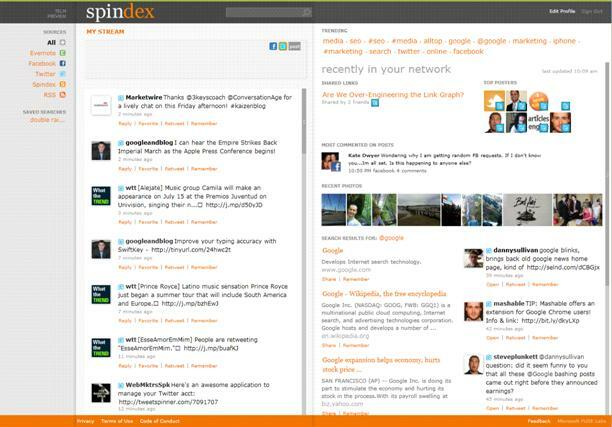 Spindex is what many people would call an aggregator. FUSE Labs disagrees. In the video posted above, we find out it’s a “personal search engine for social media” that actually analyzes the content within your networks to find out what’s trending and who’s who among your entire social audience. Presumably, it brings you the information you’d be most interested in with regards to only your communities online. And by “entire,” they mean only Facebook, Twitter and RSS feeds (Oh, and Evernote, too, but not sure that counts). But, FUSE Labs ensures us there are more services on the way, and for those of you who can’t live without your intriguing Foursquare updates and such, you can still access some of those via the Twitter stream on Spindex for now. Down to the nitty gritty. 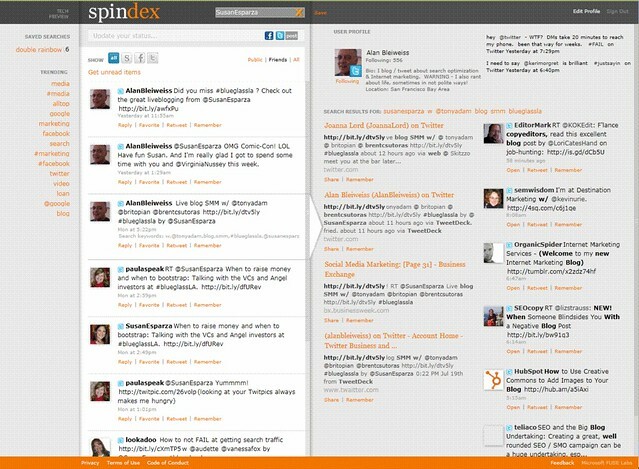 Here’s a screen shot of what the Spindex home view looks like. And since they just changed the layout in the past day, we can compare some of the updates they’re making in real time. As you can see, the new layout is a lot easier on the eyes. The screen is more segmented with the use of gray and white backgrounds versus all white. And since they moved some functions around and added a couple new ones, I’ve been rewriting away; guess that’s the risk of reporting on something that’s in beta. 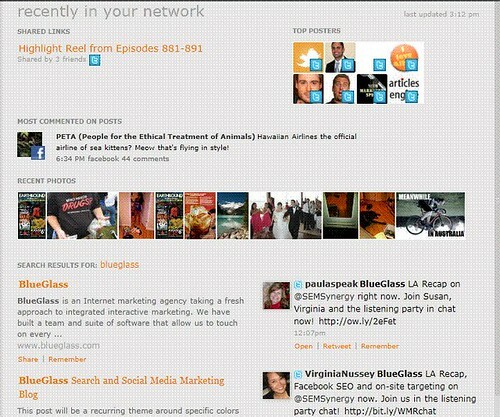 On the far left-hand side of the screen, you have your “trending” topics shown by keywords. These are the most talked about items across all your networks (depending on what community or communities your Spindex is set to). Above that is your saved searches. Mine happens to be “double rainbow” because, well, you can never get enough of that. This feature allows you to save keywords you look up within your network of communities through Spindex, in case you don’t have time to check out the results right away or if you want to monitor topics regularly. The white column to the right is your network updates rolled into one feed. You can select the “All” button to combine all your community feeds in one place, or filter it down to just one, like Facebook. The next column over features pictures towards the top of the most active people in your community (those that are posting the most). If you click on one of the images, your feed on the left-hand side is updated with just that person’s posts via Twitter and Facebook. Underneath the cluster of “Top Posters” is the most commented-on posts in Facebook (looks like it gathers posts from the entire week), right above recent pictures uploaded by people in your network. Now, look under the images area and you’ll see Spindex’s search results for related material on the trending topics in your networks (if no specific keyword query is performed). The search results are pulled from Bing and other places. One thing I wanted to figure out was how Spindex was pulling in the Bing results – was it based on recent news or top rankings in the SERP? Turns out, it’s both, depending on what you’re looking up. I wanted to see if the Bing suggestions in Spindex matched that of a Bing SERP. To test it, I looked up “toast” in Spindex – because let’s face it, toast is tasty. 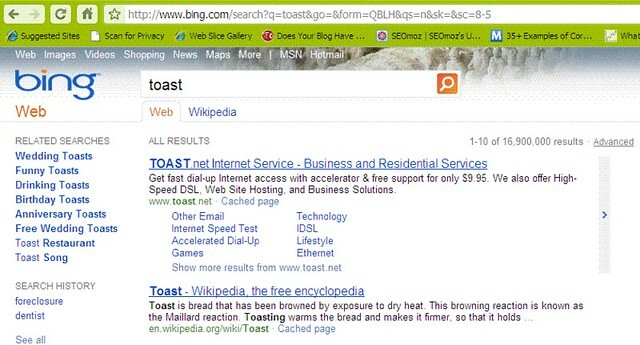 This screen shot shows the information pulled up for a search on toast. A new feature added in the past couple days is the ability to drill down into your community feed (middle white column) even further. In the upper right-hand corner of the column, you can select all mentions of the keyword “toast” either in the public community, just your circle of friends or both. Pretty neat. 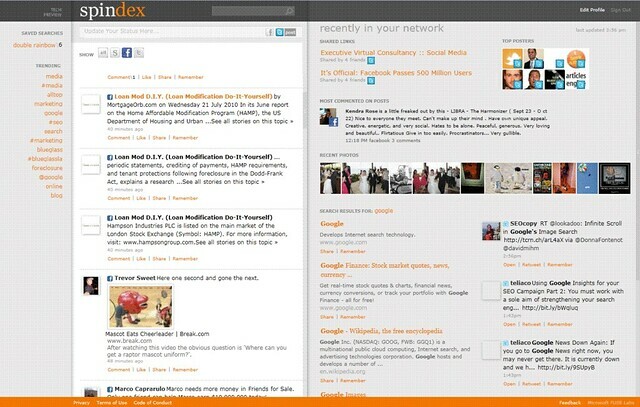 Now, let’s take a closer look at the feed in the middle column in Spindex, where you can excavate your network of choice. Selecting only Facebook pulls up the most recent posts from that community, sort of like you would see on your Facebook home page. The right-hand column in gray next to the feed features Bing search results and trending topics based on that feed. And even though you can still participate in a community like Facebook via Spindex, some might feel like the experience falls short. I mean, you can’t directly stalk people’s profiles as easily; however, you can access Facebook at any time through certain entry points in posts – although it’s not always instinctive where. The middle column shows all mentions of the lovely @SusanEsparza in Twitter. You can dig further by selecting a person in the feed that mentioned Susan, for example, and the right-hand side of the screen in gray brings up information about that person that mentioned Susan and suggests other results based on “keywords” it finds in that person’s tweet. I like it. One thing that’s lacking: no URL shortener or courtesy spell check for updates posted to your feed via Spindex. Both those features would make it more efficient. And it seems as though the updates in the stream are not as real time as they could be for a fast-moving service like Twitter. These are all things that will be worked out in time, I’m sure. Unlike a double rainbow, does Spindex really have to “mean” anything? (By the way, check out this sick Deadmau5 version of double rainbow, courtesy of Ms. Virginia.) Some say Spindex will be the next big thing. I say it’s another step towards making social media work for us, not the other way around. So I applaud the concept. 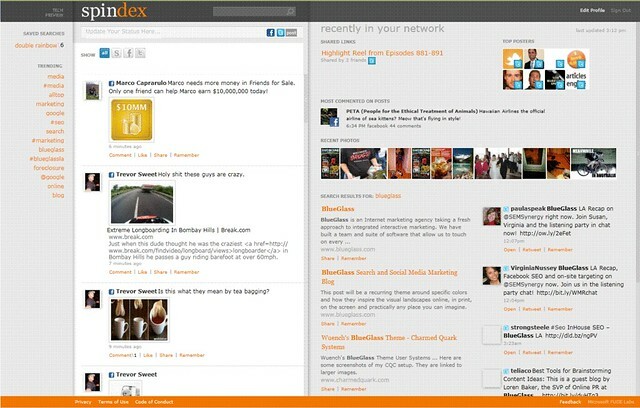 For businesses, I see Spindex as an opportunity to make social media more efficient, allow companies to become part of the deeper discussion, manage the brand a little easier online and really get to know the community that follows that brand; seems like you can do a fair amount of data mining with this service, so I definitely see the potential. Is it going to dominate? We’ll see. But one thing is for sure, I smell yet another chance to capitalize on ad space. Thanks to FUSE Labs for letting me poke around in its latest creation. UPDATE 11/19: The new version of Spindex is live and available to everyone. Check it out! RockMelt, Blekko, Spindex: Will New Kids on the Block Survive? Great info on Spindex Jessica. It could be something to look forward to from Microsoft. We haven’t had much of that lately. Hey, Mark! Thanks for reading and joining the discussion! Appreciate it. And doubly glad my titles dupe people into reading — mwahahahaha (evil laugh). In the market for spandex, are we? I hadn’t even heard of Spindex before, so thanks for sharing Jessica. It’s going to make ‘handling’ my social community easier than ever. I must confess i thought the title of the article said something else, which is why i was drawn to it. Does that make me a bad person? Hey, Michael, glad you liked it — thanks for taking the time to read and let us know! thanks for all the information on Spindex, very informative & helpful. Really appreciate it.